Yarns and threads as conductors of electricity and data: With its smart yarns, the Amann Group provides textile solutions for areas of application that go well beyond sewing and embroidery threads. At stand B51 in Hall 5.1 at Texprocess, the thread specialist will present its innovative responses to the challenges of the future. 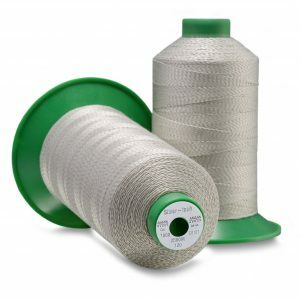 They ensure a secure hold, replace plastic components or take on safety-relevant tasks: threads are an essential part of ultra-modern technological products for a wide variety of industries and do far more than just perform their traditional functions in seams. The Amann Group is a significant driving force behind this further development. Among the forward-looking developments are its smart yarns, intelligent threads that can be used as sensors or transfer media, for example. The applications of conductive threads are wide-ranging. They can transfer electricity and data and thus provide information about the stress on components, temperature or humidity. Embroidered on car seats as touch switches or incorporated into the sole of a shoe, these intelligent threads could replace raw material-intensive plastic switches and cables. This not only makes them significantly more environmentally friendly; they are also easy to process and more pleasant to grasp or wear. Conductive threads can also offer advantages in medical technology: as an essential component of pain relief belts, the use of Amann’s conductive thread Silver-tech enables electrical impulses to be transmitted to the nerve endings, which has a positive effect on the patient’s pain memory. Besides new fields of application, various processing methods also play an important role. 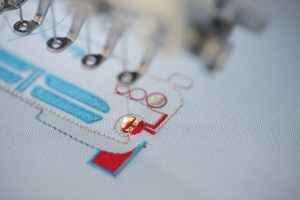 Threads are now no longer only sewn or embroidered , the conductive Steel-tech thread for example can be integrated directly into the fabric and takes on the role of an RFID antenna, recording the number of wash cycles of an item of clothing, for example. Conductive threads can also be suitable as pressure sensors that are used in composite material recording stress data. The thread specialist conceives and develops innovative concepts relating to smart yarns in close cooperation with the customer in its own Innovation Lab. With examples like these, the company clearly demonstrates how the company is expanding its classic product range with forward-looking solutions and opening up new fields of application. “Thanks to our longstanding experience and our investments into our Innovation Lab, we consider ourselves as pioneers of forward-looking solutions relating to threads”, says Bodo Th. Bölzle, CEO and Chairman of the Management Board of the Amann Group. “We are also proud to be part of innovations in other industries, whereby our smart yarns are crucial in showing the way”.